“Palms are a common and almost expected part of Florida landscapes. After all, the Sabal palmetto, or cabbage palm, is Florida’s state tree. Palms differ from true trees in that they are monocotyledons or grass-like plants, meaning they have one seed leaf. Palms also differ from trees in that they do not produce bark and do not heal from an injury as do plants with woody external tissue. The growing point, or heart of the palm, is the terminal bud. This terminal bud is the only point from which the palm can grow. If the terminal bud is damaged or removed, the palm cannot replace old leaves with new leaves, and it will eventually die. A healthy and properly pruned palm should have a full-rounded head with leaves down to the trunk. Many consumers have become accustomed to seeing palms that resemble feather dusters and assume incorrectly that the feather duster look is healthy. The feather duster look is also known as the hurricane or Mohawk cut. This over pruning results in a weaker palm structure as the palm trunk will become thin at the head and more likely to fail during high wind events. This thinning is called pencil necking. The excessive removal of leaves that creates this unnatural look also induces nutritional deficiencies. According to Dr. Timothy Broschat, Institution of Food and Agricultural Sciences at University of Florida, virtually all palms in the state of Florida are potassium deficient. You can recognize potassium deficiency by translucent yellow or orange spotting of leaves, or marginal or leaf tip necrosis (browning), most severe on the oldest fronds beginning at the tips and moving toward the trunk. Potassium deficiency causes premature leaf death, and as a result, most palms are unable to support a full canopy of leaves. A typical palm in Florida may only have half the number of fronds it should before pruning. Palms should be trimmed and not pruned. Only completely dead leaves should be removed. It is best not to trim leaves that are not completely dead, even though they may look unsightly, as these unsightly leaves provide the potassium source for new leaves. If unsightly leaves are removed, the new leaves will pull potassium from the remaining lower, once healthy leaves. These healthy leaves will soon look unsightly too and with continued leaf removal, eventually the canopy will decline and the palm can die. It is fine to remove flowers, fruit stalks, and leaves badly damaged from the wind or cold. Think about looking at a clock on a wall. 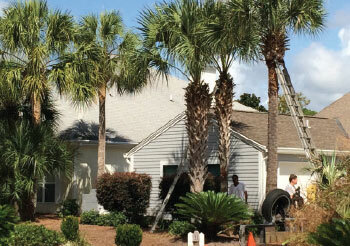 Never, ever prune a palm above the 9–3 p.m. area and better yet, allow the palm to develop a full-rounded head. Pruning affects a palm’s vigor, nutritional health, and cold hardiness. A full-rounded head on a palm provides more insulation and wind deflection protecting the terminal bud from wind and cold damage. Older leaves provide a nutrient source for new leaves. Not all palms need pruning. Palms with crown shafts, an area of smooth, usually green, tightly-clasped leaves at the top of the gray trunk, are self-pruning. Within a few days, a leaf will go from green to orange-brown to completely brown and fall off on its own. Foxtail and Royal palms are self-pruning. The Mexican Fan palm will retain dead leaves until it reaches a height of about 30 feet, when the old leaves will begin to drop off on their own. Removing the dead leaves from this palm before they fall off on their own may be appropriate to reduce the fear of the palm harboring vermin. Pruning tools can transmit disease. It is important to clean pruning tools between palms. Tools should be soaked in 25 percent bleach or pine oil cleaner, or 50 percent alcohol for five to ten minutes between palms. For more information about the nine principles of the Florida-Friendly LandscapingTM Program or for assistance with gardening related questions, contact your local county UF/IFAS Extension and/or visit the University of Florida websites: http://solutionsforyourlife.com and http://edis.ifas.ufl.edu.